How about a Sunday morning Tumbleweed Farm breakfast post for y’all? I was going to hold out and post this later in the week but hot damn….this morning treat can’t wait and I think we could all use a little something delicious to boost our spirits these days! Besides, breakfast is the most important meal of the day and when you nail that ,the sky is the limit! This recipe is not only simple but is a crowed pleaser to boot. We twice baked a couple of our favorite winter squash (Sweet Dumplings) and after they were almost done roasting we removed them from the oven, cracked a few fresh eggs into the centers and continued baking until the eggs were set and the squash halves were caramelized. The result is an absolutely delicious breakfast that’s bursting with flavor and nutrition to fuel you through whatever your day entails. It’s reminiscent of a childhood favorite of both mine and Taylor’s— “eggs-in-a-basket.” However, the mighty winter squash stands in for bread. This recipe works best with small squash with shallow “holes” scooped out. With that being said, use whatever winter squash you can find if you’re unable to locate Sweet Dumplings. Small sugar pumpkins, butternuts or even acorn squash will work beautifully (be mindful that the cooking times will vary depending on sizes). Also feel free to go crazy with seasonings! We just added salt, pepper and fresh thyme but any seasonings you’d like would go well here. Think spicy–paprika, cumin, chili or harissa. Or go the sweet route– cinnamon, nutmeg, maple syrup and a pinch of cayenne. This is one of those “throw it together” meals that will work no matter what you choose. Go wild! Pour a cup of coffee and dig in! Cut the top 1/2 off of each squash leaving about 3/4 inch deep “nests” (you can roast the tops along with the squash bottoms and eat them on the side). Drizzle the squash with olive oil and sprinkle with salt, pepper and a pinch of fresh thyme. Place cut side down on a rimmed baking sheet and roast until tender and browned, about 25 minutes (this time will vary greatly depending on the size of your squash). Crack the eggs into individual ramekins. 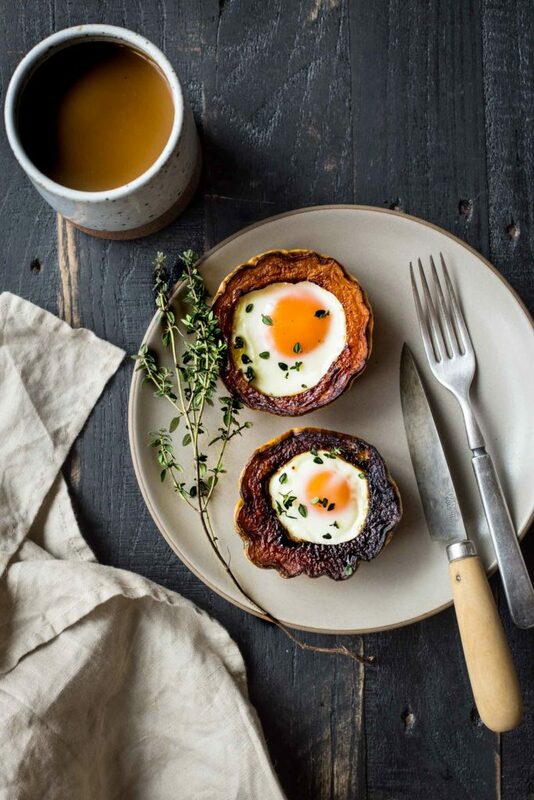 Remove the squash from the oven, flip the squash upright and slide the cracked eggs into each “nest.’ Return to the oven and bake until the eggs are set and the squash is a deep golden brown. Serve with hot sauce, herbs, and any seasonings you desire.